2016 NYC Trip Photos #27: Queens of the Modern Age « Midlife Crisis Crossover! New York City’s uniquely hard-coded DNA is everywhere around if you know where to look. Sometimes it’s right over your head and ridiculously literal. When you’re gallivanting around Manhattan and exploring the same sights everyone tells you are must-sees, it’s easy to forget New York City has more than one borough. Unless we find reasons to visit them of our own accord, we outsiders are happy to stay latched on to the biased mental images that movies and TV gave us. The Bronx has tough guys and a zoo; Staten Island has the only ferry in New York and not much else; Brooklyn has either the trendy food or the most colorful TV shows, depending on your preferred channels; and Queens is the other one. A handful of us remember Peter Parker is from Forest Hill in Queens, but otherwise it’s the baseline Big Apple stand-in. Queens is to New York City what Vancouver is to all the other major cities. Or so we out-of-towners think, because sometimes we can be uninformed simpletons. Not a kind of auto detailing we have back home in Indiana. Come to think of it, that’s what our 2011 sidestep into Manhattan’s Lower East Side looked like before we retreated. 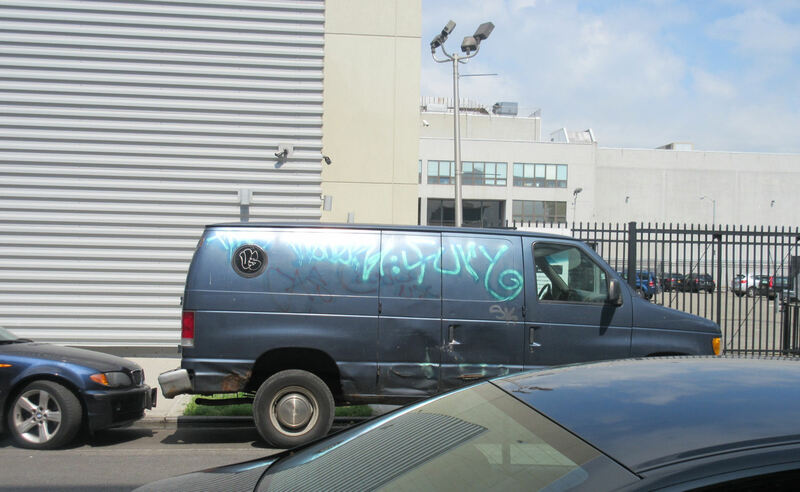 That van was part of the scenery around the Museum of the Moving Image, which we visited on Day Five. Beyond the museum, Queens isn’t a Day-Glo playground like the more heavily trafficked parts of Manhattan. It’s any given, living, breathing, everyday neighborhood like ours back home. People live and work here, and there just so happen to be a few points of interest between them and the subway stations. We tried not to look or act like yokels while we were guests on their streets, and I hope we didn’t fail at it. 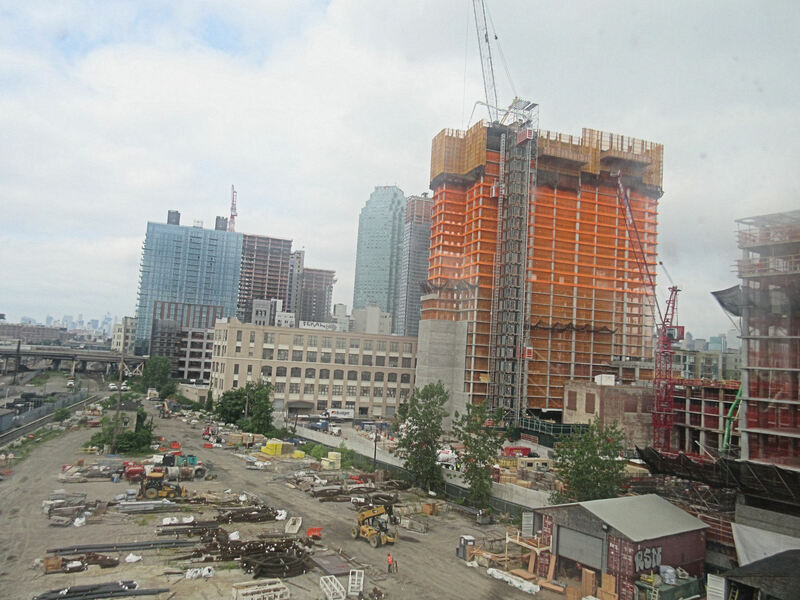 One of many construction sites we saw on our ride into Queens. Someone’s got plans to keep it rising up. Most of our Day Six hike was within the boundaries of Flushing Meadows-Corona Park, the second largest park in NYC, an oasis of greenery amid the concrete and asphalt located a half-mile from the nearest station. I wouldn’t call it a convenient stop, but the history and character more than compensate for the summer electrolyte loss. 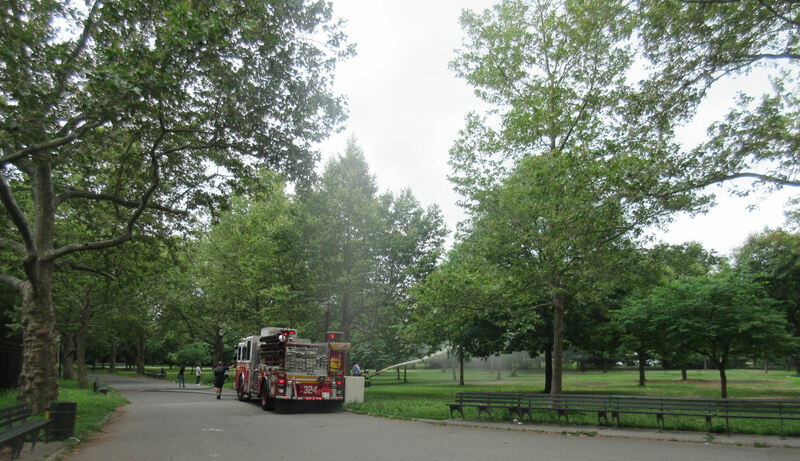 As we approached the zoo, we passed the firefighting crew of Engine 324 spraying down the grass as some sort of service or function beyond our need-to-know scope. Or maybe just because summer. 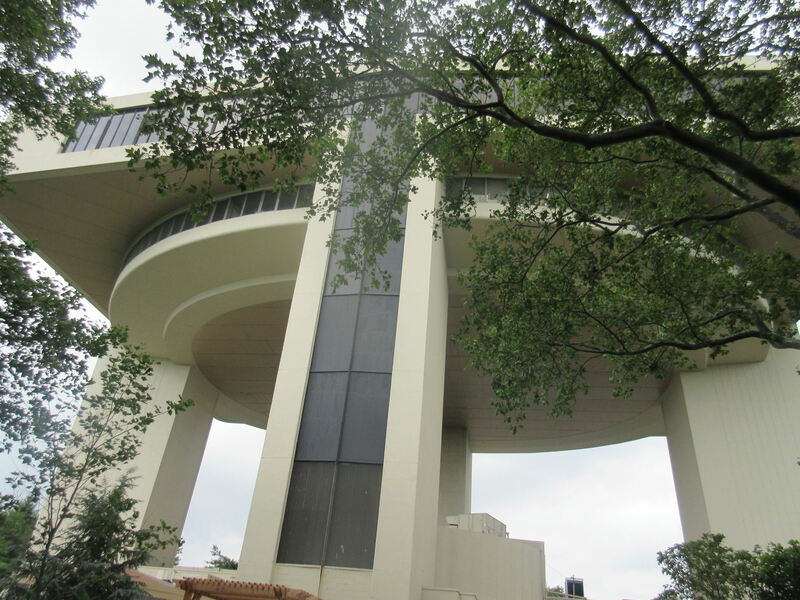 Also nearby is the structure that once served as the helipad for the 1964 New York World’s Fair. Now it’s Terrace on the Park, a banquet and catering facility ideal for hosting your next wedding or someday playing the part of Titans Tower in a Teen Titans live-action film. 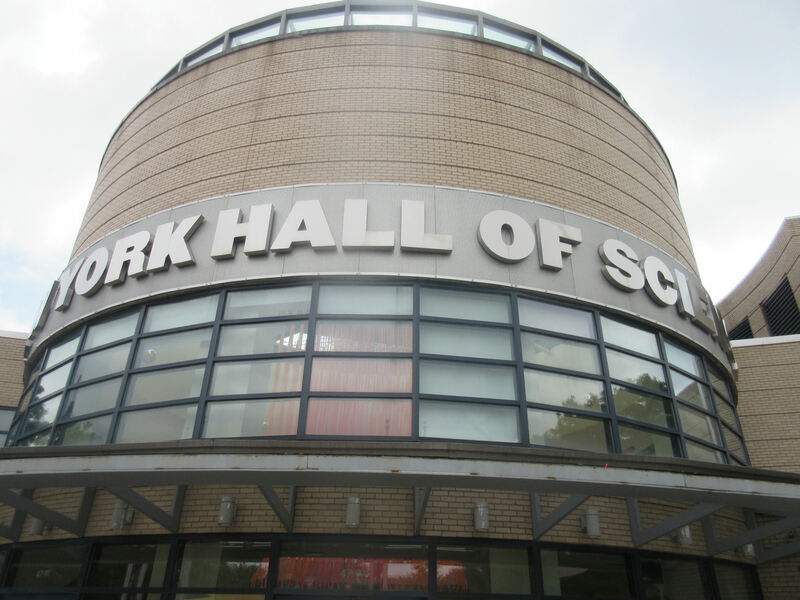 Before we reached any of our planned destinations, we encountered something we hadn’t expected or prepared for: the New York Hall of Science, a hands-on museum serving kids and adults in the area and daring to do business without an IMAX theater, a bold feat for a science museum in this era. Much of the building was a World’s Fair component but was later restored and revivified for extended educational purposes. This entry could be partly subtitled “The New York Hall of Science on $0.00 a Day” in keeping with chapters from previous MCC travelogs. Our week’s stay was nearly at an end and our budget reserves were in the yellow. We could afford an extra indulgence or two, but we ultimately opted out of this one. My son is now in his 20s. We stopped Googling “science museums” in our vacation research years ago. 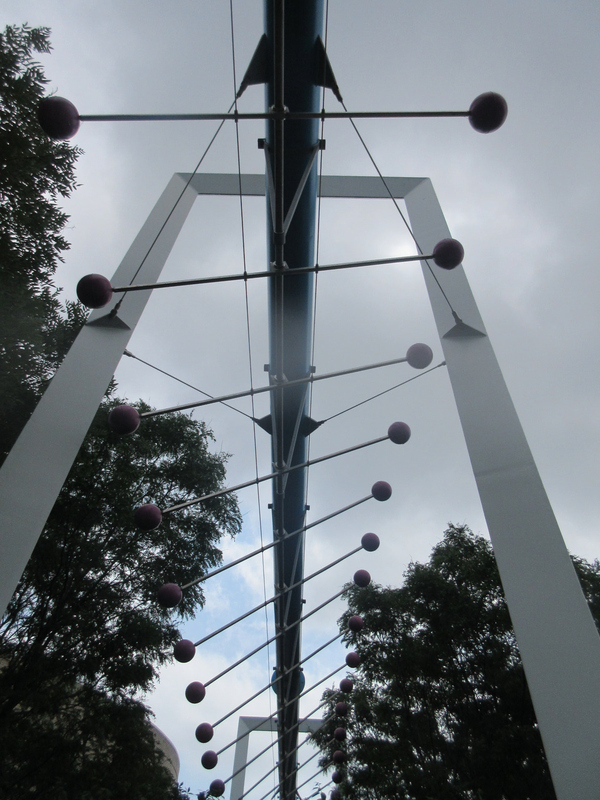 After seeing so many of these in other states, there’s only so many new ways you can learn about magnets and fossils. It’s surely worth your time if you and your kids are in the area, whether by rental car or by walking adventure. The surrounding grounds hint at the potential inside. 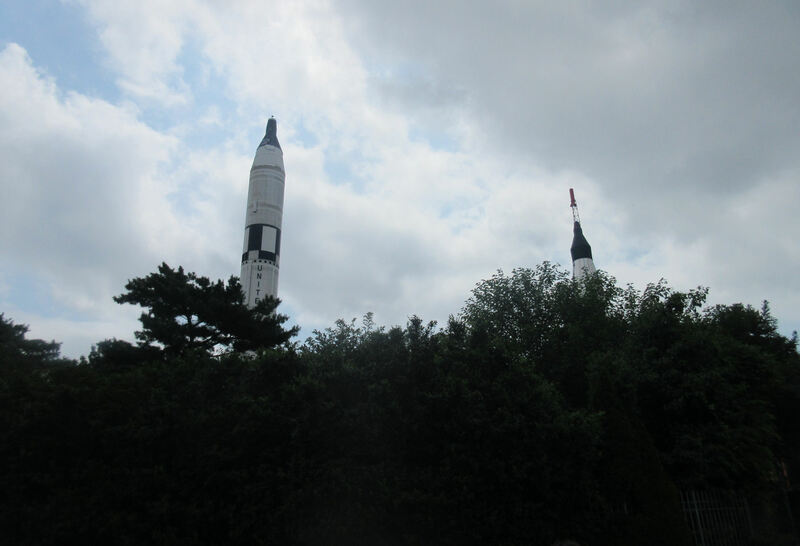 A Gemini Titan II and a Mercury Atlas-D rocket are actual 1964 World’s Fair donated leftovers that are the centerpieces of their aerospace section known as Rocket Park. 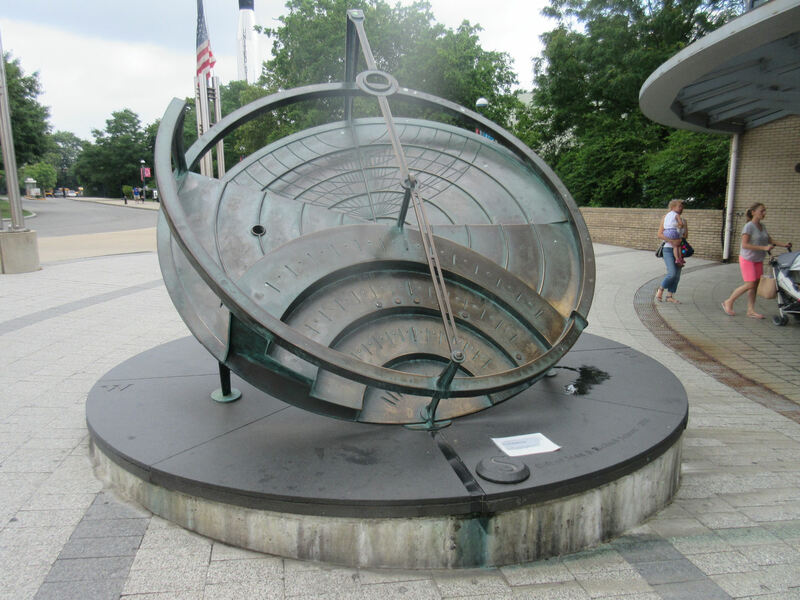 The Sun Sculpture is 13 feet wide, 25,000 pounds of pure working sundial if you know how to use one. 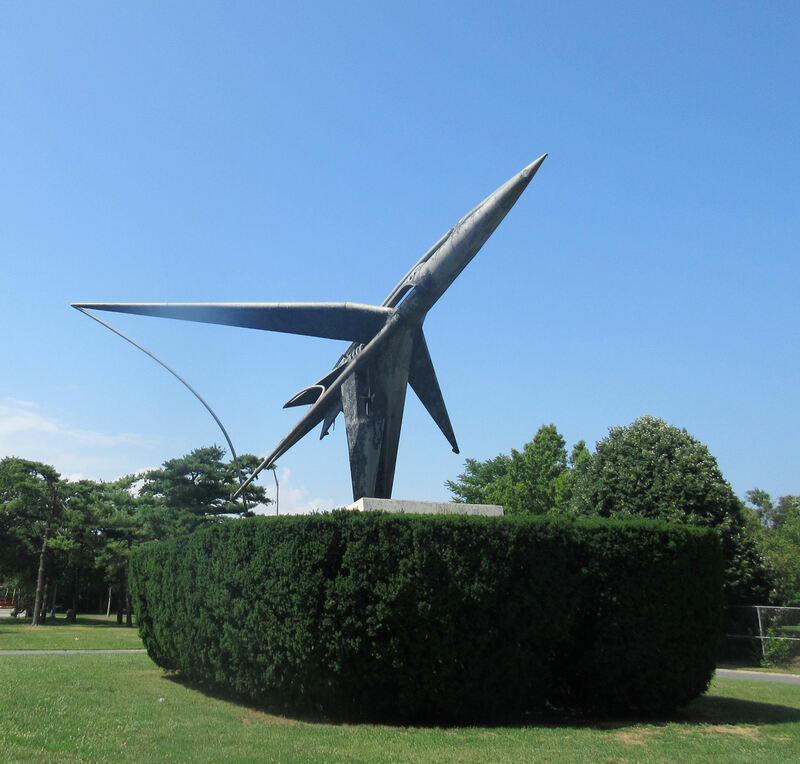 Theodore Roszak’s “Forms in Transit” is another spaceflight trophy from that World’s Fair. 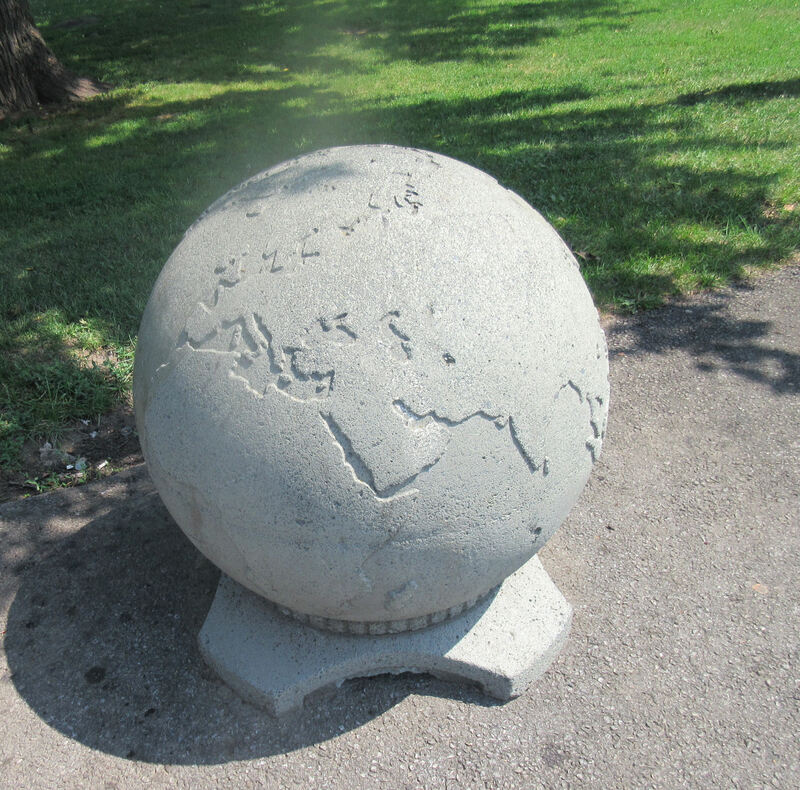 Miniature stone Earth as parking lot marker and/or emergency one-person bench. Once we were done with the Queens Museum, the walk back to the subway felt twice as long and three times hotter. We stopped for refreshments inside a mom-‘n’-pop grocery store with narrow aisles and merchandise stacked up to the ceiling. They were as friendly as you’d hope and didn’t glare or mock or overcharge us, and we remain grateful to them for helping us dehydrated wanderers live to see the end of the day in those city blocks in which we saw nary a restaurant. 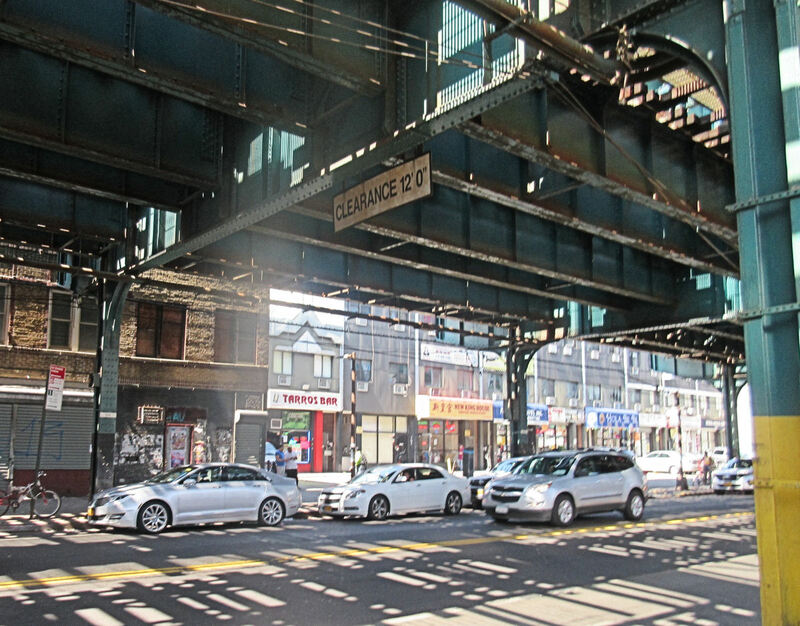 The shade under the 111th St. Station was a nice respite from the sun’s killer rays. Unfortunately we had to enter and board upstairs. The crowded #7 train eventually showed up at early rush hour and escorted us back to Manhattan so we could finish out our vacation experience with one last dinner. I kept one eye out the window toward Queens, and the other eye flipping through the night’s Broadway schedule, seeing if there were any last-minute grand finales we might be tempted to cram in before bedtime. This late in our hectic week, immersed in an urban environment more closely resembling home than anything on Times Square had, nothing showy or outlandish sounded appealing to any of us anymore. Sometimes we don’t need a city to impress us nonstop like a non-custodial fun-Dad. Sometimes we’re okay with keeping our feet in the real world. Sunnyside Yard, one of many rail yards throughout the boroughs. Our view of Manhattan while we rode the rails one last time for the year. 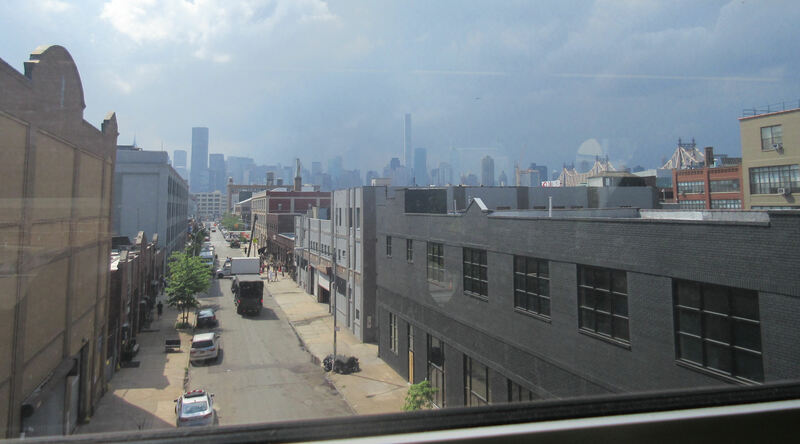 Rain clouds had overtaken the island in our absence, leaving Queens the sunny side of the street for a spell.